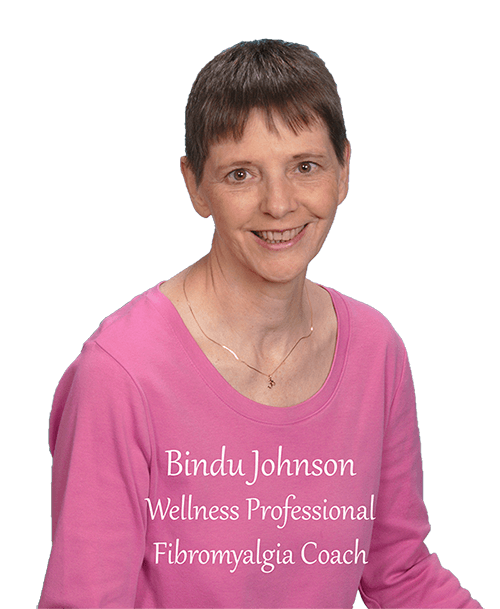 Hi, I’m Bindu Johnson, and my commitment is to help you rebuild your health so that you have the energy to reclaim your life and enjoy the things that you love. I am here because . . . I want to reclaim my life. I want to learn how to heal my body. I want to be able to spend quality time with my family and friends. I want to pursue a career or find my right livlihood. I want to know that I am making progress on my health. I want to receive support during my healing process. I enjoy working closely with you (my clients) to fully understand the difficulties that you face and unravel the underlying causes of your health challenges. I will be there to support you every step of the way. If any or all of these apply to you, you are in the right place. I have been where you are and I know the pain and despair of living with fibromyalgia. I have changed my life and reclaimed my health and you can too! Join others overcoming this same challenge in my facebook Group: I Want to be Healthy! Why am I so committed to helping people with fibromyalgia? I spent years struggling with my health. I felt lost and alone. Nobody understood my pain, my struggle or how desperate I felt. Through persistence, surrender, and grace, I found my way to reclaiming my health. I want my experience to be of benefit to others. To make my years of suffering to give birth to goodness. To help those who may feel as lost and alone as I felt. Because I absolutely love helping others and watching them grow and flourish. I had symptoms of fibromyalgia many years before I had ever heard of it. It took me years to bring together the pieces, understand the progression of this syndrome, and then to reverse that progression into healing. I’d like to share my journey with you and what I have learned so that you can shorten your journey and travel with greater peace of mind and hope. My earliest symptoms began as leg cramps as a child. I was told these were normal growing pains. I accepted this and set up a pattern where I believed that living in pain was normal and acceptable. Additional symptoms began, and by the time I was in my early twenties, I was miserable. I was in chronic pain, I couldn’t eat without severe abdominal spasms, I was tired all the time, and I suffered from depression, insomnia, anxiety, and brain fog. I was a compulsive eater and a sugar addict. I totally sucked at relationships. I was a CPA but found no satisfaction in what I was doing and wasn’t dealing well with the stress of the corporate world. I knew I needed to make a major change in my life. I set off on a journey to heal myself. Over the next years, much of my focus and intention was to heal myself. I worked with many doctors and holistic practitioners, chased many miracle treatments, and explored yoga and spirituality. I continued with the practices that helped and walked away from those that did not show progress. There were many times where I felt discouraged and wanted to give up, but I knew that wasn’t an option so I pressed on. It took me several years to fully understand how sick I really was and then to move toward healing. I discovered that healing was not an event but a journey. Complete healing wasn’t just about healing the physical body. I needed to create balance in my body and heal the wounds of my heart. I became familiar with my mind and reevaluated and shifted my belief systems. I discovered my core values that have become the guiding light in my life. I have explored spirituality and reconnected with the Divine of my understanding. I have learned to manage the mundane aspects of my life, discover the joys of living simply, and to savor the profound satisfaction of finding and living my life purpose. I have awakened, enlivened, and empowered my own inner wisdom. I have discovered that life is a process of ever-increasing Integrative Wholeness. My journey continues to evolve and unfold. I now love the process of healing, growing, and evolving and can’t imagine living any other way. In distilling all that I have learned, I believe in healing the person, not the dis-ease. Each person is unique and their journey to healing is unique as well. Healing is like putting together a puzzle–finding the right pieces and putting them together in the right sequence. As the pieces of the puzzle are found and put together, balance is regained, health comes together, and peace is restored. As I went through process of rebuilding my health, I became certified in the modalities that felt the most beneficial to me. After a while, I realized that I knew more about healing fibromyalgia than many practitioners. I became my own healer by listening to my body and applying what I was learning in my trainings. At that point, my healing began to progress more quickly. This helped me to understand the power of listening to your body aligned with a well designed protocol. I now live a blessed life! Over the last several years, I have created a life that I love. I live in a small town with my two kitty companions. I enjoy gardening, sewing, reading, and improving my yard my house. I love continuing to study and learn more about healing, wholeness and inner peace. I love working with my clients and watching them grow and reclaim their health and their life. I feel very abundant and peaceful. I still have challenges to overcome. But now, I have the confidence and the tools to move beyond them. I know that I am on the road to complete healing–physically, emotionally, mentally, and spiritually. I have learned the importance of all aspects of our being. Healing the physical isn’t complete without healing the mind, emotions, and spirit–and vice-versa. Ready to rebuild your health and reclaim your life? Join my facebook Group: I Want to be Healthy!